United Ramen dishes are created using traditions inspired by Japan and infused with different cultural flavours. After spending three years in Asia Pacific, American-Brit owner Aaron found the lack of great noodle shops in London frustrating and created United Ramen as an ode to the great Ramen he found in Japan. United Ramen is the new kid on the Ramen block. Situated on trendy Upper Street in Islington, the brightly coloured restaurant made me feel like I had walked into the ramen version of Yo! Sushi. The menu is split into sections – UR Ramen, deep rich broths; Hiyashi Ramen, cold ramen noodle salads; a range of sides and specials. As you would imagine there is also a range of sake on offer, along with some fun bubble teas. Owner Aaron didn’t want to imitate authentic Japanese ramen, instead he makes nods to the delicious noodle bowls and adds his own flair. Diners can choose from two different kinds of noodles – thin and straight, which cling together to capture more broth as you slurp; and thick and wavy, which have more bounce and trap more topping. Ali ordered the healthy Zesty Teriyaki Butternut Hiyashi Ramen and I opted for a slightly less healthy, but healthy nonetheless Chashu Pork Miso Ramen, along with a side of Pork Gyoza and Salted Edamame. The broth that is used for the ramen at United Ramen is all made on site dialy and contains no artificial additives or MSG. I could really taste the freshness of the broth and I thoroughly enjoyed the springy and chewy noodles. I tried Bubble Tea for the first time and although I enjoyed the taste, wasn’t able to polish it off as the thick tapioca balls were starting to fill me up! Nevertheless, I gave it a good go. We finished off with three mochi for dessert – two chocolate and one raspberry. I know I love chocolate mochi but the raspberry was a nice surprise with sorbet in the middle. Overall we enjoyed our United Ramen experience. Good fresh food at low prices, what’s not to like? UR Ramen from £9, Hiyashi Ramen from £7, sides from £3. Bubble Tea from £2.50. 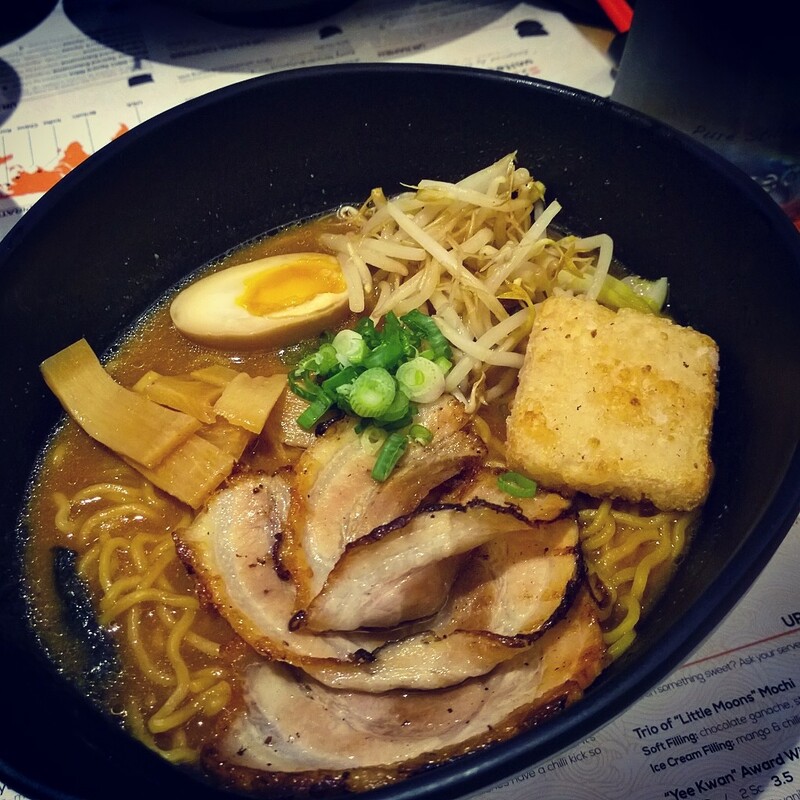 Glad you enjoyed United Ramen: Aaron is our next door neighbour and we went to try it out in its opening week. Did you go for lunch or dinner? Please can you take me? foodforthink special?